I should have titled this post: I missa Harissa. It's taken a great deal of time to collect what seem to me authentic recipes for ras el hanout and harissa. The words had to be translated in to Arabic and searches performed, and facts obtained at great effort. I use chile as the correct spelling. You may also see chili, chilli, chille. Harissa is usually called a paste. Commercially it comes in tubes, and cans. More modern manufacturers are putting it in glass jars. A recent (August 2016) trip to the gourmet shop showed jars (10 oz.) for $10 to $12 a jar. Same at a supermarket was $6. That's pricey stuff for chile paste. Chinese Lee Kum Kee Garlic Chili Sauce is under $4. Why is it called paste and not sauce? I conjecture that it was sold in tubes and when the Arabs (maybe specifically Tunisians) started exporting it to the USA, they had to tell the US gov't. what it was and they learned that stuff in tubes is “paste”, like toothpaste or painters inks (sold in tubes). 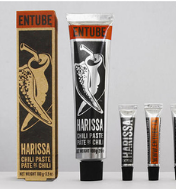 So paste stuck, and while harissa is thick like a paste, it's a sauce because it is often mixed with other ingredients, before being incorporated into a recipe. At right is a label of one Tunisian maker's. It shows having 14% solids of chiles. Another brand I saw had 73%. So maybe that limns the amount of heat, but as I want to make my own, those percentages are but guidelines. The chiles are 50,000 on the Scoville Scale. But that isn't too important. The flavor should be what matters. Heat can be controlled by the addition of tomato sauce or other diluters. I manage heat by finding the weight of the ingredients, the heat scale of the specific chile and making a ratio and proportion. In the recipe below, about 964 grams of ingredients are mixed with 12 grams of Habanero chile (976 grams total weight). Because the Habanero has 300,000 Scoville units, if I were using chiles with 50,000 Scoville units, I would need 6 times as much weight to obtain the same amount of spiciness. The math is now easy, 6 times 12 grams is 72 grams. Yes, sometimes chiles vary by heat and Habaneros are reported at having between 250,000 and 300,000. I can only suggest using a pinch extra chile flakes and stand the batch overnight to get hotter. From what I read, some makers use tomatoes. Some use hard to get or expensive spices such as: cubeb peppers, acerola berries, safron, et alia. My modest understanding is that this sauce is widely “canned” by home gardeners and frozen flat in plastic freezer bags for use throughout the year. My original reading on it suggested a whisper of mustard powder and mint would work the magic and that's what I'm pursuing, below. That's the secret ingredient. I'm going to use some sodium benzoate in mine as I have no space in the freezer. (usage rate for this is .1% — one tenth of one percent weight by weight). If you want to be a traditionalist, after the sauce is in it's storage container, cover it with the oil you used to make the sauce. Some of the “modern” harissa recipes start with dried chiles, reconstitute them and grind them in a food-processor to a “paste". Others use bell peppers. Some whole tomatoes. It takes adding extra olive oil to make their recipes work. I shall avoid them here, as I consider the recipe comes from a time before electricity. Yes that means using a mortar, but I will use a food-processor, but not with reconstituted, watered down foods. 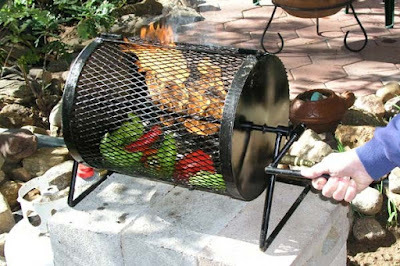 Soaking the chiles in water or liquids and discarding the bulk of the liquids is like throwing the flavor away. It defeats the purpose of making the homemade foodstuff. I know that some of Mexican cuisine reconstitutes chiles and makes sauce. But I have no evidence that the Maghrebis do this, except for the lady's post from the Catskills. For the sake of completeness, I'm offering a link to the sauce made with dried chiles. It won't have the nice bright red color, but you may find it to your liking. I saw one video where the lady has 12 pounds of fresh Cayenne chiles. A brief search for Cayennes fresh from a market yields no results. So those are homegrown only. I have no garden. I would like my sauce to make 2 cups. My guesstimate is to use two pounds of chiles. If that yields more than 2 cups, I have an extra jar. I want this sauce to be a bright red and will include a little tomato paste to help with the color. As tomato paste is a thickener, I may use a little fresh but peeled tomato to thin it somewhat. It also will have a little sugar to balance the tomato flavor. As it turned out, the tomato was unnecessary. The last time I saw ripe red jalapeños at the market they were $5.00 a pound. That's a bit pricey as green jalapeños can get to 3 pounds for a dollar late in the season. However I found red New Mexico chiles at $2 a pound at the market and used them. Some Arabic author calls for roasted chiles. I find fresh vegetables don't roast (toast) well, unless subjected to open flame. I don't have an appliance capable of doing that. That is to say, I'm not putting them on the bbq grill and blazing away just to approximate the unusual chile from the Maghreb that has a smokey-raiseney taste. Select chiles that are heavy for their size. I give the weights in grams and volumes as I want the sauce to be flavorful, but not too hot. The red chiles, but not the Habanero, are simmered in water, covered for 15 minutes. This time isn't critical, but what is requisite is to soften the chiles. Leave them whole with the stems intact. Remove them to a colander to drain and cool. While the chiles are being softened, collect and weigh the other ingredients. After 5 minutes of cooling the chiles are cool enough to touch. But before you do that, put on pair of nitrile or latex gloves. This will protect your hands from the heat of cooking and the heat from the Habanero, too. This is an important step. Pre-heat a small skillet. I prefer my 6" cast iron. Any will do. This is how the cumin and caraway will be toasted. If you want more or other spices, such as coriander, add or subtract, ad lib. Stem and remove most of the seeds. Set aside. If the spice skillet is hot, toast the spices, checking them for aroma. It's pretty obvious when they change from raw to toasted by the aroma. Make the mustard. If you don't have powder, use yellow or Dijon. If you are making the mustard, cover and reserve a minimum of 10 minutes for the flavor to develop. Peel the garlic and while wearing gloves cut the Habanero in pieces. Reserve. While the coriander seeds are pictured here, I forgot them this time. On balance, I would use more caraway, mint and mustard in the next batch. That's a personal preference only. If you have an electric spice grinder, put the salt, black peppercorns and all the other spices in it, except the garlic, mustard and mint. If you are using sodium benzoate, add it too. Grind to a fine powder. Reserve. Tear the red chiles into strips, lengthwise. This helps the food processor blade do it's job. Put them into the food processor bowl. Pulse a few times, to make the beginning of the sauce. Next add the Habanero and the garlic. Pulse to blend. Add the spices, mint and lemon juice. Pulse to blend. Lastly with the blade spinning, stream in the olive oil. To not overprocess, we are looking for a chunkiness. I have my jar sitting on the kitchen counter and after 3 days, the flavors are blending beautifully and getting even tastier. The sauce continues to thicken and will need a little water to make it as thick as ketchup. I put about a teaspoon in a bowl of fava beans and it brightened the bland bean flavor nicely. Typical uses are on hamburgers, chicken wings, pasta, as a chicken marinade — diluted with vinegar and oil. Add a spoonfull to a bowl of Kalamata or mixed black and green olives as a mezze or tapa.